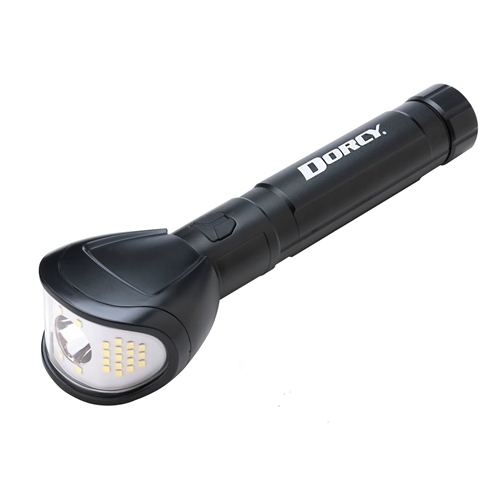 A remarkable new flashlight with 850 lumens and up to a 220 degree beam. The 6AA Wide Beam Flashlight offers three distinct modes of powerful lighting with an easy to use switching system. The first mode gives you a powerful center beam flashlight. The second provides a wide spot beam of light using a series of powerful LEDs that shed light on either side of you. The third mode utilizes both sources of light, resulting in a 220 degree beam of light, 850 lumens of power, and a beam which reaches hundreds of meters down range. In addition, if you require less light output, simply press and hold the switch to dim the light to fit your needs. Comes with 6 AA Alkaline batteries.